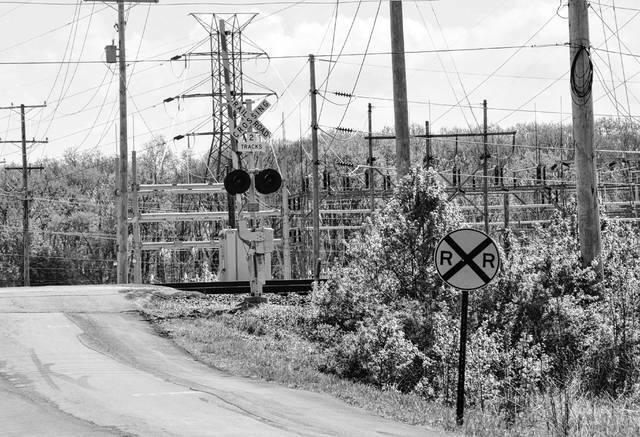 Pictured is the railroad track and AEP substation located on Slack Road, just west of the Liberty Road/Slack Road intersection. The City of Delaware Planning Commission recently voted in favor of recommending to City Council approval of a preliminary and final development plan for a 50,000-square-foot AEP service center to be built just west of the substation and railroad track on Slack Road. The City of Delaware Planning Commission voted unanimously May 2 to recommend to City Council approval of a preliminary and final development plan for a 50,000-square-foot AEP service center to be built on the south side of Slack Road, just west of Liberty Road. Second ward representative Jim Halter expressed concerns about the condition of Slack Road and its ability to handle the increase in traffic. Efland said the economic development director, along with city council and the city manager, are working through some incentive agreements that would include an offsite infrastructure agreement that would see improvements made from the service center entryway, east to Liberty Road. Included in that agreement would be improvements to the approach of the railroad tracks that cross Slack Road between the future service center and the existing AEP substation that sits on the corner of Slack and Liberty roads. Tom Wolber, a member of the City of Delaware Shade Tree Commission, was present to voice concerns over plans for tree preservation of wooded area that sits directly behind the intended site, and its effect on the tree canopy for the city. City council is expected to consider the matter at its May 14 meeting.